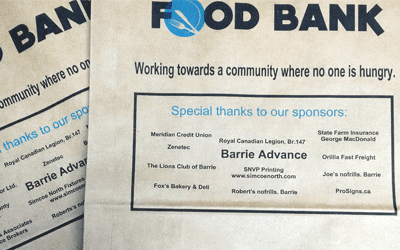 The Thanksgiving Food Drive will kick off Thursday September 29th, 2016 with over 52,000 food bank donation bags being distributed out into the Barrie community through the Barrie Advance. This year’s goal is to raise 145,000 pounds of food during the month of October. We would like to encourage you to fill the bag and drop it into any of the donation bins located inside our local grocery stores. You may also drop the bag off at the Barrie Food Bank located at 42 Anne St South. Thank you for helping us move closer to a “Community Where no One is Hungry”.